Moses Cone health System selected ASG to implement the rollout campaign of the new Cone Health brand. ASG was selected and contracted to oversee the implementation of permanent signage at seven hospitals, two medical centers and many other offsite medical facilities. 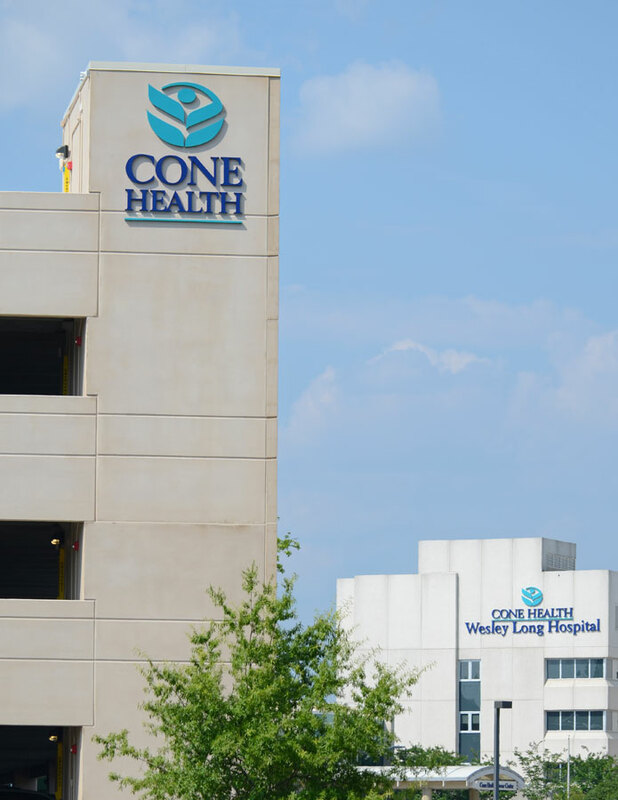 This process took over one and a half years to complete and involved the transformation of existing interior and exterior sign structures, and in some cases, complete replacements to the new Cone Health brand. ASG developed and administered bid documents to potential sign fabricators and assisted Cone Health in the final selection of the sign fabricator. ASG managed and coordinated all subcontracted work related to the install of newly branded signage. Every sign had to be accounted for, inspected and document with before and after photos. This information was published and submitted to Cone Health upper management including hospital Vice Presidents. ASG has been fortunate to work with Cone Health for over 20 years in many different projects and capacities. ASG was recognized by Signs Of The Times, a leading signage web publication, for their work at the NC Zoological Park. ASG placed third overall in the International Sign Contest for commercial sign systems. We are extremely honored to be the recipient of the award with such a talented field from all over the world.